Do you know what PDF Maker is? PDF Maker looks like a useful program, but it is not. In fact, we suggest that it is a potentially unwanted program (PUP) that you ought to delete. Why is that so? It is suggested that the extension can help you convert files, but, in reality, the only thing it can do is route you to feed.pdf-maker.com and then to Yahoo Search. Since this routing action is pretty quick, you might not even notice it, and if Yahoo Search is your preferred default search provider, you might think that no changes have occurred at all. That is not exactly the case. Although the PUP redirects to a familiar search engine, it might be responsible for modifying the results and injecting sponsored content. Continue reading to learn why that is not a good thing; if it is not obvious already. You should also continue reading if you want information that will help you remove PDF Maker. Although the creator of PDF Maker is portal.pdf-maker.com, the application cannot be downloaded from this website. Instead, you might find it at chrome.google.com/webstore/detail/pdf-maker/lpmedofaljioejmmdbbdbkadeenbgjcf, or you might install it via a suspicious page or using a bundled installer. Our researchers warn that adware servers can introduce users to the installer of the PUP, and it could be displayed as a banner offer or show up via a pop-up on certain websites. If you are ever forced to download something unfamiliar and suspicious – don’t give in. You also have to be careful about bundled installers. Before you accept unfamiliar programs, research them carefully. If you suspect that PDF Maker is not the only strange application, you should perform a full system scan. Employ a trusted scanner if you want to know if there are any threats that require removal. If other suspicious, undesirable programs do not exist on your computer, you can clear it by following the instructions below. This manual removal guide shows how to remove PDF Maker extension and how to clear browsing data. Both of these steps are simple and absolutely necessary. If you want to remove other existing threats manually too, you need to make sure you are cautious. Failure to eliminate everything could put your virtual security at risk. If you do not want to take any risks, maybe it is time to install anti-malware software. 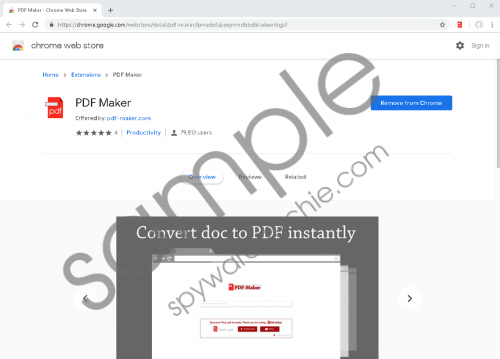 It would automatically delete PDF Maker and then it would make sure that other PUPs and dangerous malware could not slither into your operating system in the future. Open Google Chrome and enter chrome://extensions into the address bar. Identify the undesirable extension and then click the Remove button. Enter chrome://settings/clearBrowserData into the address bar. Select time range and boxes and then click Clear data. Although you might have had great hopes for PDF Maker, this potentially unwanted program is 100% useless. The only thing it can do for you is route you to a page that you can easily access on your own. Other than that, this program is set to record information about your activity and then redirect your searches to a third-party search engine, whose results could be modified to show sponsored links. Due to all of these reasons, our recommended move for you is to delete PDF Maker. You can do that manually, and that should be enough if the PUP is the only thing you want to remove, or you can employ anti-malware software. In either case, do not forget to think about your virtual security in the future, which, of course, is much easier to do with the help of anti-malware software. Tags: delete PDF Maker, PDF Maker, remove PDF Maker.